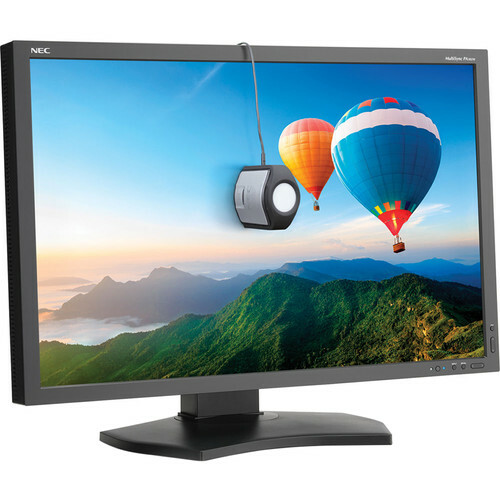 See my color management wishlist and get NEC PA302W at B&H Photo. Unless you already have the NEC calibrator and software, be sure to get the NEC PA302W BK-SV. The NEC PA302W is my workhorse display on which I do all my photography work. It is a 30-inch 2560 X 1600 wide-gamut display with true hardware calibration (not faux calibration). The PA302W calibrates to within 1 delta-A accuracy (that’s for nerds, it means “amazingly accurate and your eyes are probably not that good”). There is a lot to like about the NEC PA302W, which is why I consider it the finest display available today for evaluating and processing images (though the iMac 5K is my preferred display for viewing images). That is why I call it my workhorse display. The NEC PA302W is the display I will be installing in my mobile photography adventure van. Screen resolution of 2560 X 1600 in a 30" form factor, for eye-friendly pixel density that allows me to quickly evaluate image sharpness. As well as the 1600-high thing: *way* better than 1440 (including the “looks like” 2560 X 1440 of the iMac 5K). Color gamut that extends *way* beyond the AdobeRGB color space, important for making decisions on saturation and color subtlety, plus today’s printers are also beyond AdobeRGB gamut. Neutral backlighting— the GB-R backlighting delivers a neutral gray—not the magenta-tinted “gray” W-LED displays that most calibration devices see as neutral, but is in fact tinted magenta to the human eye, or at least my eyes, which are unusually good for color discrimination. Low glare—unlike the iMac 5K, the NEC PA302W has surface coating that works well in all sorts of lighting conditions, and does not display the walls behind my back. 4-year warranty. Compare that to the abbreviated 1 year warranty Apple provides. Below, the PA302W with SpectraView II calibration kit is at the lowest price of the year, just $1679. THe PA272W is also excellent, but I prefer 2560 X 1600 over 2560 X 1440 for more working area. Below, check out that color gamut! The inside triangle is AdobeRGB, which falls far short of what the NEC PA302W offers. I use the 16-bit ProPhotoRGB color space for most of my work, outputting to AdobeRGB JPEG files unless the image is out of gamut in AdobeRGB. Can a 2016 MacBook Pro support an 8K display?. What’s the Best Way to Enjoy Images at their Finest? 2.5K or 4K or 5K Display for Image Editing and Viewing?